We had decided to spend a last full day in Kyoto before taking the night bus back to Tokyo (which is less than half as many yen as the Shinkansen bullet train and would also save us on a hotel for the evening), but unfortunately moody Mother Nature got in the way. Typhoon Melor was about to make landfall in Kyoto, and our first taste was a gross, rainy day on which we quickly ran out of indoor activities. We cut the sightseeing short and went to the central station to buy our bus tickets and hunker down until the 10pm departure. This ga ve us seven hours to invent a scavenger hunt game in which we made a list of items--such as kimono, blue sneakers, a landmark from our trip so far--and each had an hour and a half with the camera to find as many as possible in the station. Surprises were that Louis Vuitton luggage was a cinch to find, and mittens were near impossible. The mittens plus a last minute Santa Claus shot secured Patrick the victory. This time. In any case the time flew by and before we knew it, it was time to board the bus. We ventured outside to the terminal and found no bus, zero people waiting to board, and a lone bus official making Japanese announcements into a megaphone. We handed him our tickets and he politely informed us that this bus was canceled and we could get a refund at the station. Darn that Typhoon Melor. Rather pissed that we had waited all day only to be forced to shell out for a train after all, we cashed in our useless tickets and made a dash to the Shinkansen sales desk. But the last train left at 9:30, and our next option was a 6am bullet train the next morning. We were not keen on the idea of adding a hotel to our unexpected costs of the day (or returning to Uno House), and figuring what's another eight hours of waiting, we settled in to camp out at the station over night. But unfortunately for us, the Kyoto Station turns into a pumpkin at midnight. They kicked us out, locking the doors behind us, and we literally spent the night on the street. The rain got pretty bad at 4am on our walk back to the opening station, not to mention the howling winds which destroyed our umbrellas and hurled a branch right off a tree at Patrick's noggin. Now reading the news reports, turns out this was just about the time Melor made landfall in Kyoto. We were very, very happy when we finally sunk into our warm, dry seats on the 6am Shinkansen. 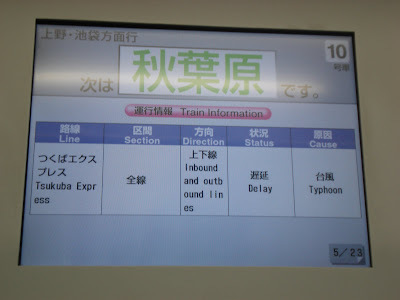 But the typhoon wasn't done with us yet; the ride that took us two and a half hours the first time lasted more than four, as we tiptoed down the tracks towards Tokyo to subdue the effects of Melor's wrath. Thankfully, we were in no rush as we used the time to catch some shuteye, but the businesspeople with whom we shared our ride were less than pleased. When we finally got to Tokyo we jumped in line behind them at the "Fare Adjustment" booth, not knowing what to expect. In exchange for showing the woman our tickets we got handed a big wad of yen, amounting to about half the fare. Score! Despite public transportation being in disarray--and by disarray, we mean resembling the dail y delays of the Boston T--Melor had left us with a beautiful day in Tokyo. 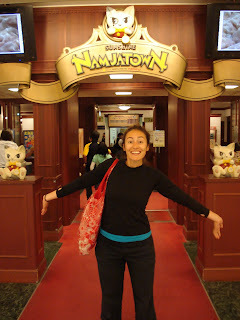 We'd been eager to see Sunshine City, a 60-story skyscraper in Ikebukuro, mainly because of Namjatown. Occupying two floors it's something of a mini Disney World, but with anime characters, and most importantly for us, food "amusement parks". There is a dumpling hall with each booth offering dozens of varieties of the bite size snack, and taking up half the upper floor is Ice Cream City. We were awed by the freezer cases displaying hundreds of flavors, from plain old vanilla to delicacies like viper and caviar. We opted to sample a few that intrigued us: red pepper was delightfully zesty, black sesame super delicious (attention Haagen Dazs! ), garlic left a bit of an unpleasant aftertaste, and charcoal was pleasantly smoky with a faint grit. 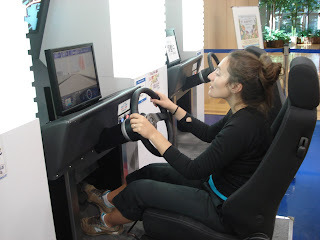 Across the street from Sunshine City is the Toyota Amulux showroom, a massive adult playground with not only the latest cars on display but "safety demonstrations" that basically amount to video games. There is also a theater that is supposed to be some sort of fun multi-sensory experience, but unfortunately they only have shows on weekends and holidays. By this point we'd pretty much had all the action we could take on two hours of sleep so we made our way to Ueno to check back in to the Oak Hotel. Oh how we'd missed it. After a week at Uno House we appreciated even more the bed, bathroom, and robes we'd been so fond of the first time. That night we ate up a last satisfying meal of sushi before hitting the pillows for a good, long-awaited, deep sleep. View more pictures from Tokyo Part Ni at the end of our Tokyo album. Nice post. I was in Tokyo in my worldwide tour by flight from London. 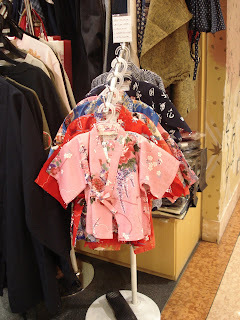 I was with my friends, we got many adventures in Tokyo. I spent a good time there.